This site has been up for around 3 years now. My thanks to all who have posted (apart from the spammers). I'm sure other members and guests won't object if I say a particular thanks to those who have reached the status of 'Gods" - you are the guys who have made the site something of a community. I thought it was time for me to give something back. I've been working on some basic Horse and Musket rules lately, and decided to produce a SYW version for this site. They can be found in the downloads section. Feedback and questions (within this thread) would be very welcome . They are written for 28mm figures - for 15mm you can deduct a third if you want to use a smaller table, and for 6-10mm use centimetres in place of inches. 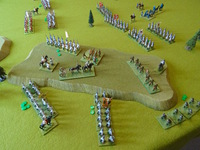 Photo below shows a recent playtest using the 'Clash at Kutzdorf' scenario. Click to enlarge. I would like to greet your new ruleset, I already managed to read through them and they seem simple and easy-to-play! As you say in your notes they are best suited for 16 figs units - splendid! This means that bigger battles may be played! -Artillery is much weaker, artillery in HoW could make a devastation, let's see how this works now. -The attached general gives flavor, brave players will expose their general in melee! Hurrah! -The turn sequences are simpler, IgoUgo style, rules are simpler, no time to spend for determining which brigade moves (if it moves), so all brigades move! -The idea of a unit retreating to all its rear sector and not exactly backwards, finds me a warm supporter! -One little reservation about move and fire: I'm afraid side B will have some advantage. As they move second, they know where to fire and they fire first! In a ruleset of mine I use the sequence: Side A moves, Side B fires, Side B moves, Side A fires and it works just ok. Your new ruleset has many more interesting points for discussion, I'm sure a game played with these rules will have a quick flow and with so few modifiers to remember it looks so easy to learn! I wish you good luck with this ruleset and I'll try to give them a go the sooner possible! Dindin - thanks for your comments. Artillery will indeed be a bit weaker in the simple rules. Your ideas about turn sequence are interesting - I'll have to look into them! It sounds really promissing. Perhaps a good idea for large refights like Lafeldt 1747 or Rocoux 1746. Although I fear that my wife would be confused because the rules are similar (inferior, regular, superior units for example) but different. Maybe it will be better for my group of gamers who prefer very simple rules. Many thanks for sharing. I felt that your designing the artillery weaker in these rules is justified by the fact that this game may be suitable for very big battles, so the OOB will be "baptised" and an infantry battalion will represent a bigger formation, while a battery might stay a battery. I agree with your idea of attackers shooting before melee. I'm always eager to see how this could apply for GNW to accurately depict the Swedish Gå–På. Congrats, you did your best to keep the rules so short and simple! I'm sure some chaps in the club who do not want to bang their heads much over rule reading, will welcome them! I saw some little spots which probably need fine tuning, but we'd better listen to all other members' feedback and I promise to come again, hopefully having played one game before! Just discovered the simple rules and they look very promising. My crew is really into simple rules these days and I have avoided trying Honours of War on them, though I think those rules are elegant. I plan on trying the simple SYW rules next week. The rules remind me of One-Hour-Wargames rules but with some soul. I think they might work well with the scenarios from that rule set, although the result might be 90 minute wargames. Melee and morale based on the current effectiveness level rather than how many hits were just received is refreshingly simple. One minor suggestion: there are numerous references to units with 4+ hits. Perhaps declare early on that such units are weary (or shaken, etc.) and then just refer to weary units throughout the rules. It's a minor thing but is less clumsy than "unit has 4+ hits". Needless to say, my mind immediately drifts to other uses for such rules, Like French and Indian War. Indians would be skirmishers who are superior for movement when in woods. Braddock's regulars of 1755 would be inferior for movement in woods. I can see the Monongahela working quite well. Edit: 56 posts makes me a god? Hmm, perhaps I'll go throw some thunderbolts out the window. I'm pleased to see someone finds the rules of interest! You'll see I suggest in the notes 'light casualties' and 'heavy casualties' for the occasions you suggest. Maybe a single word title would be even better - thanks for the suggestion. A couple more ideas and questions, all without having played a test game yet. Do the skirmishers represent a whole battalion or a detachment? This has some import for my possible future Monongahela game: how many Indian bands should I put on the table? Perhaps cavalry that do not get a definite melee result should break off contact at the end of the melee phase. I can see infantry getting involved in a prolonged close range musket brawl. I'll wait for the test game but I have a Pavlovian aversion to artillery man-handled around the field while firing. It makes me think of Mk IV tanks on the western front during the Great War. Edit: one more minor suggestion: allow cavalry in column to enter a BUA. They must remain in column while in the BUA. Skirmishers are intended to represent a full unit, for example Austrian Croat battalions (just as in HoW). Re. your second point, yes, I agree. More work needs to be done on the melee rules. Man-handled artillery - I have amended this rule so that ANY movement by artillery attracts a -1 modifier. By the way, I've settled on 'weakened' as short hand for 4 or more hits. Lutzingen is on tap for Thursday. Our figures are 15mm, with battalions/cavalry regiments on 4" frontage. I suppose I should have re-sized the table and changed movement rates and ranges. Nah, away we go. I'll post a link to the AAR Friday or Saturday. A question before our game: line infantry and cavalry cannot move to the flank within 6" of the enemy. Does this also apply to light infantry? Edit: said I wasn't going to do it, but I went ahead anyway. The measurements and ranges are for 25mm units with a frontage of about 15cm (6") and our 15mm units have 10cm (4") frontage. So I shrunk all the ranges and such by 1/3, easy enough since almost all measurements are divisible by 3. I also re-did the field from 4 X 6 feet to 32" X 4 feet. Now the Austrians can cover the ground a little easier. A good question. I would say no - formed, close order units wouldn't mess around near the enemy for fear of becoming disordered. With light units already in a loose formation this wouldn't seem to apply. Good point - thanks for raising it. Reducing measurements by a third for 15mm is exactly what I recommend in the notes to the rules. That's one of the reasons just about all the game distances are divisible by 3! Game was played, guys liked it. The AAR is in the appropriate section. Now for the questions and remarks. We had an issue with pass-through fire immediately; there is none. We decided to crib the same procedure used to fire in support/against charges, a 50% chance. Our usual rules (BBB) allow static units to fire at any time against units moving through their field of fire. This made the restricted field of fire for artillery less onerous. We may have strayed too far. Is an about-face a change of formation? We decided it was but aren't adamant. In one charge a light cavalry unit hit a badly shot-up (6 hits) grenadier battalion and forced it to retreat through their supports (causing a hit on the supports). The light cavalry then had to advance and came into contact with the supporting battalion. We decided since there was a second round of melee it should be resolved now rather than wait until the next turn. It's much more dramatic (and what we're used to). The supporting battalion saw the cavalry off. It was fast. I also think that if cavalry gets a tied result against any but artillery they should break off the fight immediately. Last, flank charges get no benefit beyond avoiding defensive fire. We did forget to have the defending units check to change facing. We had a Prussian Dragoon unit with 3 hits behind the flank of a fresh Austrian infantry battalion. We realized that if the regiment charged it would be automatically beaten, being 3 hits down. It felt strange. The solution? Perhaps the flanking unit counts as having a couple hits less when it comes to calculating winner/loser. Or perhaps give the flanker +2 on melee die rolls. The latter would not change the strange case of a cavalry unit, not quite weakened, in good morale and unable to charge a flanked infantry unit with any hope of success. Now if the infantry unit turns to face, I could see the cavalry being seen off without rolling dice. Edit: I now see that I overlooked "flanked units do not fight back in first round and get half dice after that". Our cavalry unit with 3 hits still has to leave the flanked infantry alone. Also, a unit that is beaten automatically in melee should take a hit, methinks. Beating a unit that has 6 hits to see them scamper off with a chance to rally is kind of disappointing. On a minor note, perhaps a change of terminology. Voluntary Interpenetration caused a lot of levity. Perhaps it was the wine, perhaps even though fairly venerable we are all still puerile. But passage of lines might be easier terminology, just as I prefer jaded horses to blown horses. I understand heavy through heavy but perhaps formed through formed (and define light and formed earlier) might be more precise. Or perhaps wait until the rules are closer to being done before quibbling over the like.